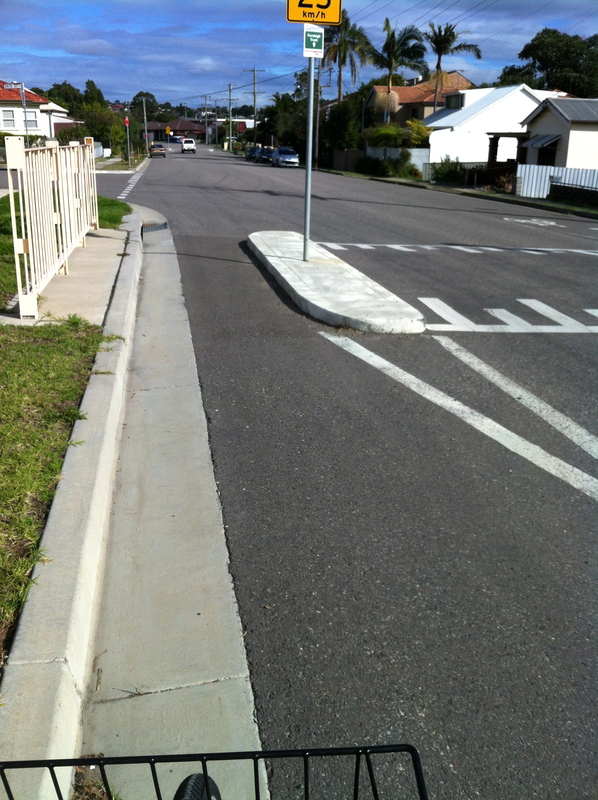 This is an example of a fairly common intersection and roundabout treatment that is employed in inner Newcastle suburbs. The squeeze point that is created by the narrowing of the road is not friendly to cyclists. 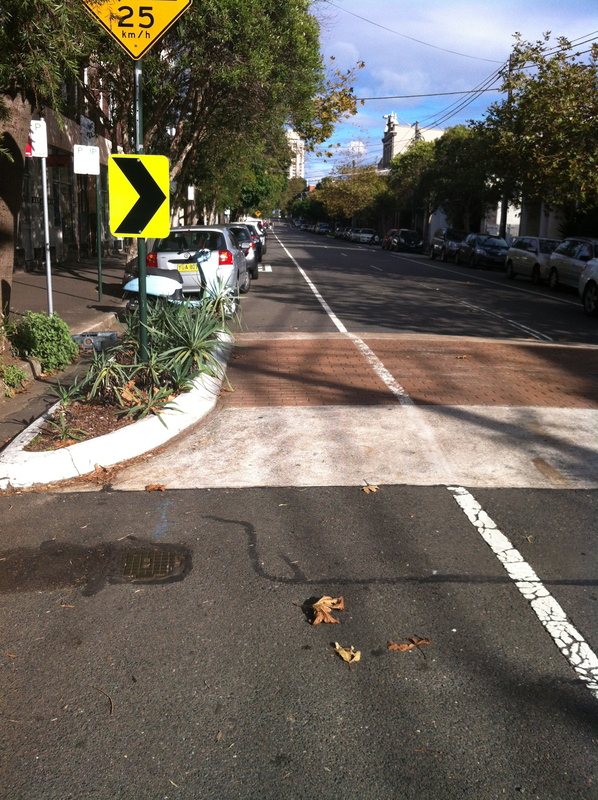 And above is an example of a similar measure being used as a traffic calming device in Inner Sydney, also creating a squeeze point that is not cycle friendly, except that it may keep cyclists a little more clear of the car door zone that soon follows it. In this post, David Hembrow talks about how the Dutch treat roundabouts for cyclists, and while the examples he gives are for the treatment of much larger rounabouts, a similar treatment can be applied to smaller roundabouts, such as the one in the first photo of mine. The gist of the Dutch solution is to create a pathway for cyclists that is separate from the rest of the roundabout traffic because it is situated a few metres outside of the traffic way of the roundabout. 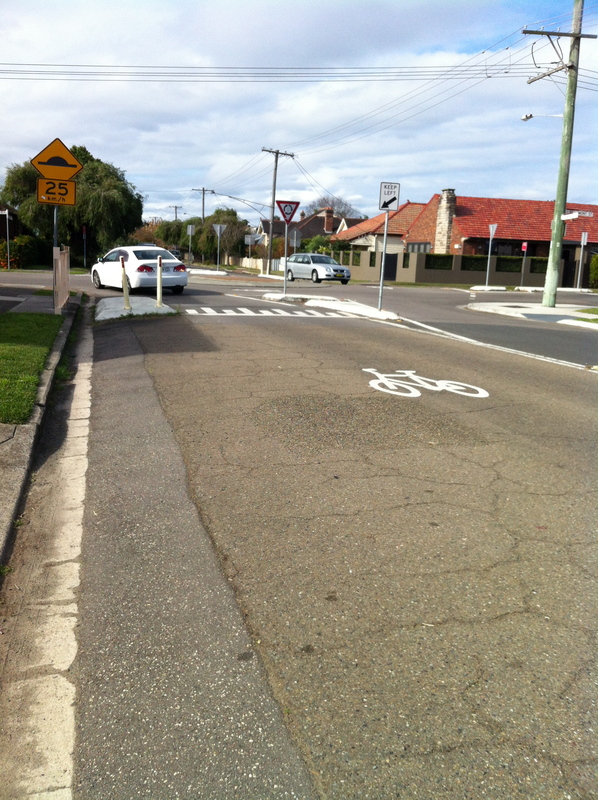 Using the above type of infrastructure, a much safer path can be created, using the traffic island, for cyclists. Cyclists would be separated from cars using the roundabout. The dangers are that cyclists may have a false sense of security about their right of way when using the roundabout, as they would still be required to give way to traffic approaching on the right. 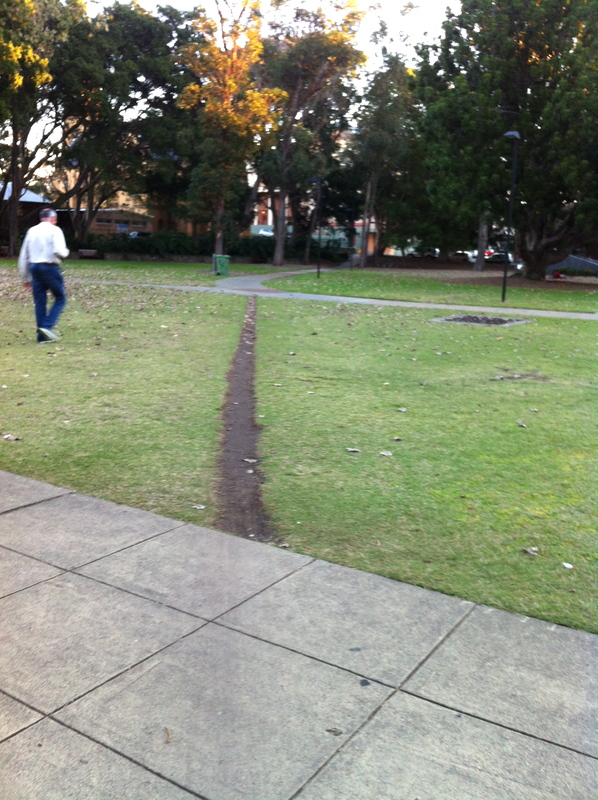 The drawback of having the cycleway too far from the intersection is that this could happen … … where cyclists have obviously been choosing the shortest path through Newcastle’s Civic Park to ride. If this happened it would render the cycle path through the intersection redundant. This entry was posted in Uncategorized and tagged infrastructure, intersections, newcastle, Roundabout, Sydney. Bookmark the permalink. Thank you for your very informed comment Wayne, your many years of living in the Netherlands have given you much insight into the way that cycling works there. The only way we can get a similar amount of cycling here is to copy what they do in terms of infrastructure, then we will see people choosing to cycle instead of using cars. for the period 1996–2000 shows that cyclists were involved in 26% of their reported injury crashes at roundabouts, compared to 6% at traffic signals and 13% at priority controlled junctions. The New Zealand researchers propose that low vehicle speeds, circulatory lane markings, and mountable centre aprons for trucks can improve the safety of cyclists within roundabouts.